Two Revgear fighters fought at Maximum Fighting Championship’s MFC 25: Vindication at the Northlands Expo Centre in Edmonton, Alberta (Canada). More than 4000 fans attended MFC 25: Vindication, and much more saw the event live on HDNet. Revgear sponsored Dwayne Lewis (11-5) had more than 400 fans in the audience from his home town of Fort McMurray, Alberta. 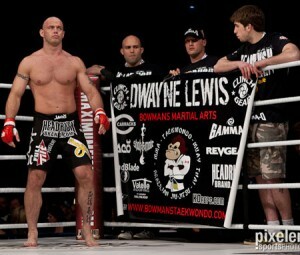 Unfortunately, Dwayne lost by unanimous decision to Emanuel Newton (13-6). Another Revgear fighter, veteran Pete Spratt (21-17) picked up the Knockout of the Night by stopping Luigi Fioravanti (17-7) at 4:02 of Round 3. Spratt took control in Round 2 doing most of his damage with brutal kicks to the body. In the third, Spratt dropped Fioravanti with a stiff jab and then pounced with a barrage that brought upon the stoppage. It’s the second straight win in the Maximum Fighting Championship for Pete Spratt.